April 27, 1972 Kwame Nkrumah, the first President of Ghana, died. Nkrumah was born September 21, 1909 in Nkroful, Gold Coast (Ghana). In 1935, he came to the United States to further his education, earning a Bachelor of Arts in 1939 and a Bachelor of Sacred Theology in 1942 from Lincoln University and a Master of Science in 1942 and a Master of Art in Philosophy in 1943 from the University of Pennsylvania. In 1947, Nkrumah returned to the Gold Coast and became the leader of the United Gold Coast Convention which was working on independence from the British. 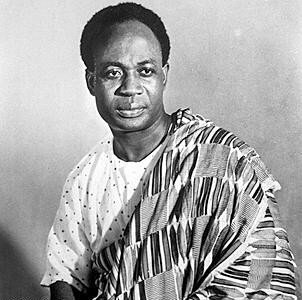 In 1950, the colonial administration arrested and sentenced Nkrumah to three years in jail for his political activities. As the result of international protests and internal resistance, Nkrumah was released from jail in 1951 and elected Prime Minister of the Gold Coast in 1952. In March, 1957, Nkrumah declared Ghana independent and in 1960 he was elected president. In February, 1966, Nkrumah’s government was overthrown in a military coup which was backed by the United States government and he went into exile in Guinea. Nkrumah is best remembered for his strong commitment to and promotion of Pan-Africanism and his significant influence in the founding of the Organization of African Unity. In 2000, he was voted Africa’s Man of the Millennium by listeners of BBC World Service. Nkrumah was a prolific author and published his autobiography, “Ghana: The Autobiography of Kwame Nkrumah” in 1957. Other works by Nkrumah include “Africa Must Unite” (1963), “Dark Days in Ghana” (1968), and “Revolutionary Path,” published posthumously in 1973.